When the sun enters Cancer, the Nile begins its increase and gradually rises day by day to twenty cubits above its winter level. In the city of old Cairo measuring devices have been constructed, and there is an agent who receives a salary of one thousand dinars to watch and see how much the level rises. 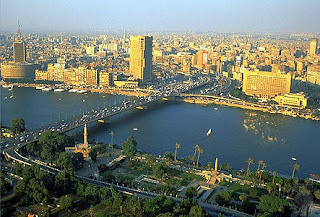 From the day it begins to increase, criers are sent through the city to proclaim how many ‘fingers’ God has increased the Nile that day. When it has risen one ell, the good news is heralded and public rejoicing proclaimed until it reaches eighteen cubits, the normal increase. Less than this is considered a deficiency, and alms are distributed, holy intentions vowed, and general sorrow ensues. More is a cause for celebration and rejoicing. Unless the level goes above eighteen cubits, the sultan’s land tax is not levied on the peasantry. 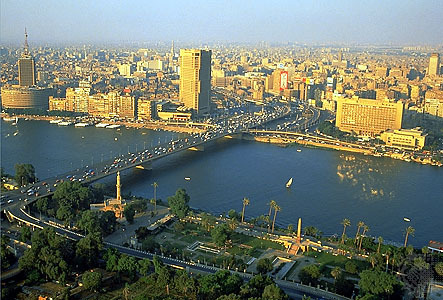 Water channels with smaller channels branching off have been dug from the Nile in all directions, and the villages of the countryside are situated along them. There are so many waterwheels that it would be difficult to count them. All country villages in Egypt are built on high places because when the Nile floods the whole land is inundated. . . . People normally travel from village to village by boat, and from one end of the realm to the other they have constructed earthen dikes, along the top of which you can walk beside the river. That structure is repaired yearly by an expert, at a cost of ten thousand dinars from the sultan’s treasury. The people of the countryside make all necessary preparations for the four months their land is beneath the water, and everyone bakes and dries enough bread to last these four months without spoiling. The water usually rises for forty days until it has risen eighteen cubits. Then it remains at that level for another forty days, neither increasing nor decreasing. Thereupon it gradually decreases for another forty days until it reaches the winter level. When the water begins to recede, the people follow it down, planting as the land is left dry. All their agriculture, winter and summer, follows this pattern. They need no other source of water. It has been justly observed indeed, by the Ancients as well as the Modems, that nothing can be a finer Sight than Egypt at two Seasons of the Year; for if a Man ascend some Mountain in the Month of August or September, he beholds a wide Sea, in which appear almost innumerable Towns and Villages, intermixe’d with Groves and Fruit- trees, whose Tops are only visible, and here and there a Causeway for Communication between one Place and another; which all together form a Prospect as agreeable as it is uncommon. On the other hand, in the Spring Months . . . the whole Country is like one continued Meadow, whose Verdure, enamell’d with Flowers, charms the Spectator, who likewise sees Flocks and Herds dispersed over all the Plains, and the Peasants busied in their rural Employments. In a word, Nature, which is then dead as it were in other Climates, seems here to be in Bloom and Gaiety.